I look forward to keeping you informed with highlights taking place in the Idaho Capitol during our legislative session. Lastly, if you do not want to receive these newsletters, you can unsubscribe below. Diagnosed when she was six years old, this nine-year old manages her Type 1 diabetes (T1D) with the help of her service dog who warns her when she experiences low glucose levels. 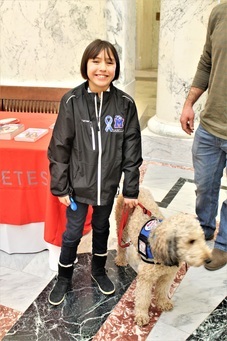 She came to the Capitol to share her experiences with lawmakers on Diabetes Awareness Day. Representatives from the Juvenile Diabetes Research Foundation (JDRF) also provided information to legislators and the public regarding a cure for T1D. JDRF is the leading global organization funding T1D research. Its mission is to accelerate life-changing breakthroughs to cure, prevent and treat T1D and its complications. JDRF is an organization built on a grassroots model of people connecting in their local communities, collaborating regionally for efficiency, and uniting on a national level to pool resources, passion and energy. Click Here to learn more about JDRF. Both the House and the Senate took time this week to commemorate the life of Abraham Lincoln. In the Senate chambers, orchestra students from Idaho Falls performed patriotic medleys for legislators. Across the way in the House chambers, students from the Idaho Fine Arts Academy of Vocal Music performed the “Star Spangled Banner” and melodies from the Civil War era. Representatives also unveiled the Dean Estes Lincoln Bronze Bust to be on permanent display in the Lincoln Auditorium of the Capitol. This week the Senate passed legislation to create health insurance waivers for agencies using local tax dollars. The legislation (SB 1219) permits the Director of the Department of Insurance to waive the requirement for a Joint Public Agency Self-Funded Health Benefits Plan to purchase aggregate stop loss insurance when certain conditions are met. Joint Public Agency Self-Funded Health Care Plans are funded by their member agencies using local tax dollars. This legislation streamlines the process for agencies and thereby reduces the cost of maintaining a self-funded health care plan. 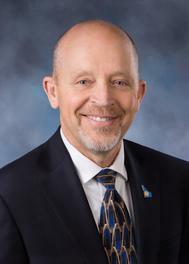 Blue Cross of Idaho is the first insurer in the state to submit plans to regulators that follow Governor Butch Otter's executive order calling for a state-based solution to health care. The plans are out of compliance with the federal Affordable Care Act. Click Here for the full story. On Wednesday on the fourth floor of the Capitol rotunda, home schooled students provided delicious homemade pies, shared creative educational displays, and performed beautiful music for the enjoyment of the public. 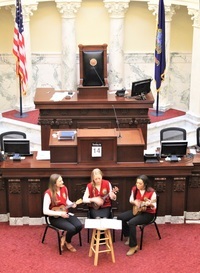 Talented legislative pages sang and performed ukulele arrangements of patriotic music as part of their farewell performance for lawmakers. This week, legislators say goodbye to the pages who have served during the first half of the session. The House and Senate Page Programs are for high school seniors between the ages of 16 and 19 years old. A page's first responsibility is to render service to lawmakers while they are on the floor debating. The page is assigned to specific committees, giving assistance to the respective committee chairmen and secretaries. The pages serve Monday through Friday for a duration of six-weeks. For more information about the Page Program click here. These bills have already passed Senate committees and are working through the legislative process. SB 1208 Agricultural Labor – allows for the use of inmate labor in production. SB 1222 Education – Bolsters Career Technical Education Secondary programs and incentive funding. SB 1229 Secretary of State – streamlines submission of early voting notification process for both the county and the Secretary of State. SB 1267 Education – Establishes a Science, Technology, Engineering & Mathematics (STEM) diploma. A STEM diploma should help those who receive it with scholarship applications, college admittance applications and job resumes.